DTCC’s BenchmarksSM service delivers a suite of powerful analytical products that enable broker/dealers and investment managers to measure and compare operational performance against that of counterparties and industry peers. When making the changes and investing the resources to stay competitive, firms must take into consideration multiple counterparties, a variety of workflows and numerous complex scenarios. Targeted analysis is essential to this process. Benchmarks, available to users of CTMSM, OASYSSM and TradeSuite ID, is DTCC’s operational performance measurement solution for broker/dealers and investment managers. The service enables firms to access timely business intelligence by providing operational performance metrics along with tools to customize views of this information and compare it to peer and industry performance. With Benchmarks, firms can monitor operational performance across all asset classes and compare it to industry averages, as well as view individual counterparty timeliness and efficiency. 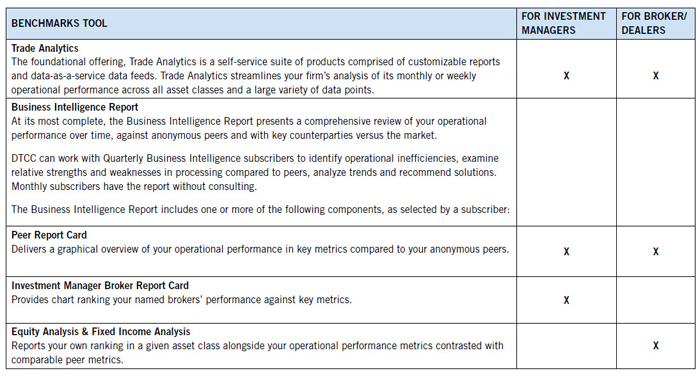 Benchmarks comprises multiple offerings within two broad categories—Trade Analytics and Business Intelligence—that can be used in combination or individually. The products can be organized at the aggregate firm level, regionally or by identifier; in addition they support customization by market, financial instrument type, location and more. Receive or download products via a browser, without installing software or scheduling development resources. Expedite analytical work by using pre-defined report templates and data-feed formats, choosing the time periods for analysis and customizing the frequency of reporting. Validate subjective survey results with quantitative data drawn from actual trade activity. Identify hidden factors that impact performance with normalized data from all trade volume with all clients. Make business operations more transparent with rich data sets including raw and aggregated, current and historical reference, transaction and asset servicing data across asset classes. Through quarterly and monthly Benchmarks Reviews, gather intelligence on market trends and priority counterparties and view your placement within a peer group for key metrics defined by the industry. Analyze trading performance across all asset classes. Pivot focus from core processing to client service, team management and competitive positioning. Drawing on your firm’s trading data sourced from CTM, OASYS or TradeSuite ID, Benchmarks’ tools enable analysis from multiple perspectives. Underlying systems data from CTM, OASYS or TradeSuite ID via QC Plus (monthly only) is aggregated on a weekly, monthly and quarterly basis. Weekly files generated on the weekend. Monthly files generated after the first Saturday of the next month. Quarterly files generated after the first Saturday of the next quarter. The weekly and monthly Trade Analytics Reports and data feed are then immediately made available online. The monthly and quarterly Business Intelligence Reports begin generation on the above days for distribution to clients. Please contact your relationship manager for the schedule for your specific report. The Quarterly Business Intelligence review discussion is scheduled at the subscriber’s convenience.